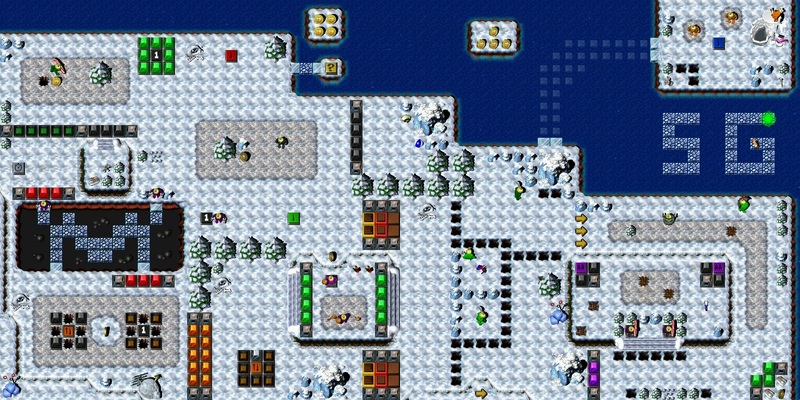 A small level that, unlike most of my other ones, does not have too many things cluttered into it and has some fairly loose areas. Its name comes from the idea that your two Gruntz are strangers on the Disgruntled island and will face the resilient local inhabitants to reach the Warpstone piece. For anyone that has played through my previous levels, this will be extremely easy. It does not have any classic hazardz (in Gruntziclez, only Rolling Ballz) nor automatic toggling bridgez, so odds are you won't even need to save and reload your game if you plan ahead. There is one thing that might catch solvers off guard, though, and would be quite frustrating to stumble upon: do not get off water on a crumbling bridge with an item on it! 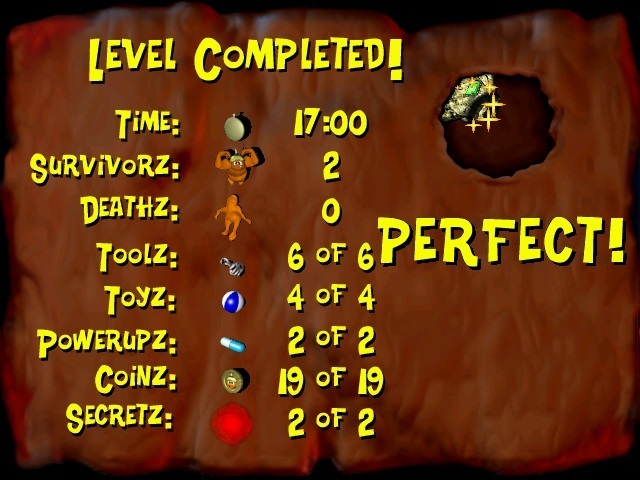 If you do, the bridge will sink too quickly (because of the long animation when a Toob Grunt gets off water) and the pickup will not be counted in your Statz screen - in this level's case, the W letter, rendering a Perfect score impossible. Walking normally from one bridge tile to another prevents this from happening. Per my statement in the 'Olio' section, this Quest is ready to be distributed. Prior to doing so, I will make my own attempt to play it under Windows 10, in hopes to verify that it is, indeed, playable within that environment. Regardless of my own success rate(? ), I will distribute it after I have made my attempt, along with my findings. For those unable to wait, the download link should work, so you may try it out yourself, before it is sent out via Gruntz Fanz e-mail distribution. Well, unfortunately, this Quest is not playable under my current environment configuration ... it is too wide. I can only reach the western Grunt, and can only move him one space toward the east ... not even to the Blue Hold Switch. So the other Grunt cannot be selected at all, nor can the first Grunt reach the Shovel. So, someone with access to the tools that allow me to open the puzzle needs to remove the restriction on the width of a puzzle, in order for Windows 10 users (like me) can move uninhibited around the map. One is that you shouldn't worry about keeping the gauntletz for too long, since the left side of the map uses the rocks purely for decoration. Got me fooled for a while. Another thing is that the bottom right corner requires you to make use of a mechanic that you may or may not be aware of... just know that every object you can access at that point is there for a reason. 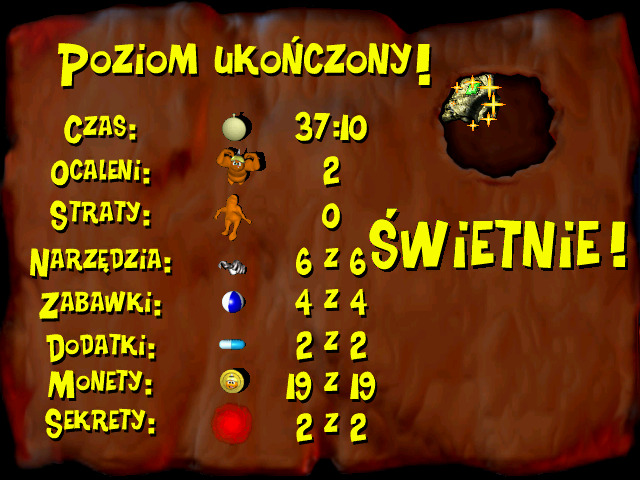 Other than that, fairly good level. I just completed updating the indices used to access this Custom Level, and uploaded the pages to the Forum's web host. Two indirect indices remain to be updated and uploaded to the web host. Now if I could only actually play these new puzzlez!!! I have down the black pyramid but who stand on the purple switchs. All I am going to say for now is that there is a way to force a grunt who uses a moving toy to stay still. Since your Gruntz can't stand on those switches (you only have two, and both are needed ahead), enemy Gruntz have to stand on them for you. The only way to get them to stay there is using toys; since yours are both mobile, you have to make sure the enemy can't move out of the switch (BEFORE they receive the toy). Unable to move, their toy will break, and they will remain on that switch assuming you do not get close to them anymore. If you give a moving toy to an enemy grunt that has no room to use it, the toy will break instantly, giving you time to walk away. Your two gruntz can get him stuck on top of the switch. But how do i bring the warpstone to the ford and how to get the W ?? You have to make sure you do everything in the right order. Get the thief on the green switch, then press the black switch (both of them), then get the thief on the red switch (do not let him steal your club), kill the guard next to the black pool, then (optionally) go for the ? switch (you will need a tool that is hidden in this area), and after that, you can go back with the warpstone. To get the W, you will have to do something while using the ? switch... pay close attention to the changed area and hopefully you will figure it out. Interesting, that wasn't how I planned this area to play out, but now I realize you can have the Thief stand on both switches. Whoops! Sorry i don't see to get the W and when i step op the ? the gruntz can not go back ?? and no hidden tool ?? Look carefully. There is something behind one of the trees. Yes i found that but i can't get to the W I don't see it ?? Step onto the rightmost edge of the island after you collect the coins and then wait for the ? switch to change the terrain back. Hmm strange that i did not see that ? ?